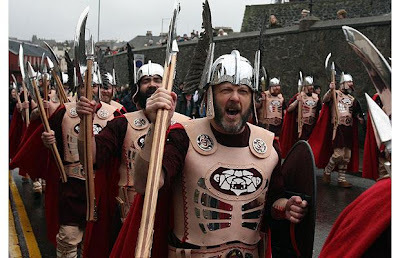 The Largs Viking Festival started in the 1980s, as a small-scale celebration of the Battle of Largs. The Battle is also commemorated by the monument popularly known as The Pencil. 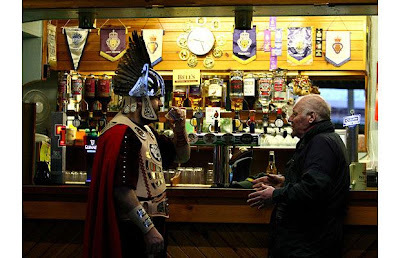 You cannot miss the importance of Vikings to Largs - with a number of references to Vikings around the town - including street names, the amusement arcade and the Viking who stands outside the Main Street chippie. There is also more serious commemoration such as the Vikingar, which is an interactive exhibit with storytellers telling Viking tales and myths and the yearly Håkon Håkonsson Lecture. There was also the mysterious painting of the Battle of unknown origin done on the wall of what used to be the Victoria Hotel. Rediscovered some ten years ago sadly it has disappeared once more, since the Victoria Hotel is now no more and even the business which replaced it now lies derelict. 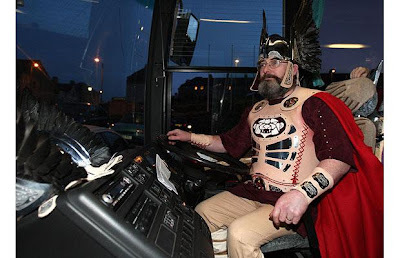 Originally, only a few Viking re-enactors were involved and the organisers attracted some of Largs homegrown talent – such as Benny Gallagher of Gallagher and Lyle, who is still going strong. 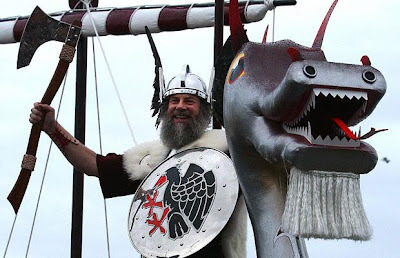 Over the years it has grown in size and in importance and so has the entertainment – in past years involving RAF displays over Largs Bay, longships and funfairs and every year a Viking Village is now built on the promenade. 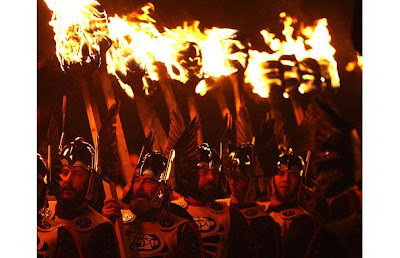 Of course, the best-loved part is the finale on the second Saturday night where a large number of Viking re-enactors take to the field in front of the Pencil and recreate the Battle of Largs in all its splendour, followed by a ceremonial boat-burning and a firework display. ...and other, less traditional, modes of transport . ...and quench their mighty Viking thirsts at inns . 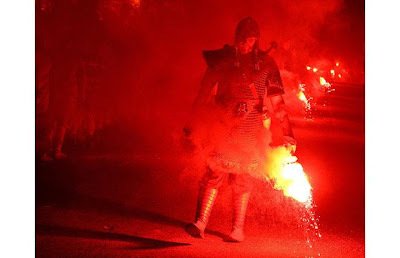 The annual event, widely regarded as Europe's biggest and best fire festival, continued as a torchlight procession when night fell . 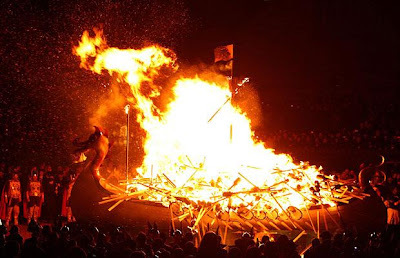 ...culminating in a 30-foot longboat being set alight . 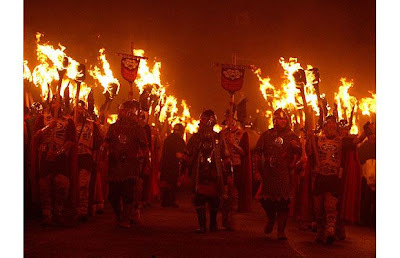 The festival began in the 19th Century and is descended from the ancient festival of Yule, which the Vikings held to celebrate the rebirth of the sun . 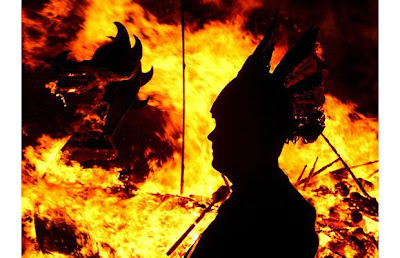 Although it originated as a Norse pagan festival it was then adopted by Christians to celebrate the end of the Christian Holy period with feasting and bonfires ..